The OBS April Spring Sale of Two-Year-Olds in Training gets underway this morning in Ocala, Fla., and the Paulick Report is pleased to offer a special print publication, available here and on the sales grounds. 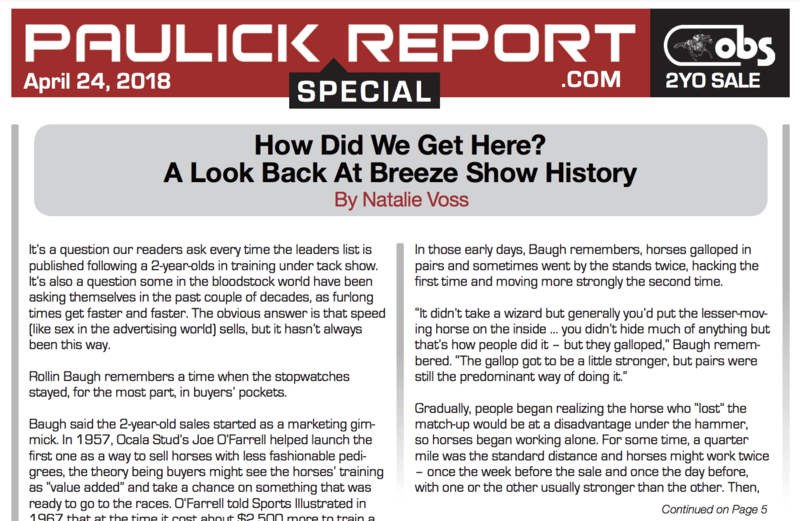 In this edition of the PR Special, Natalie Voss takes a look at the history of breeze shows. Frank Mitchell turns his Stallion Spotlight on the first crop by Fed Biz and gives us a few hip numbers to pay close attention to in Five to Watch. The Honor Roll looks at Kentucky Oaks contender and OBS April grad Midnight Bisou. And in our Ask Your Veterinarian segment, a question about the impact of low heels and long toes for racehorses. Click here to read those stories and more in this edition of the PR Special. This entry was posted in PR Special, Ray's Paddock and tagged breeze shows, Fed Biz, midnight bisou, obs, obs april, obs spring sale, PR special, Thoroughbred Auctions, thoroughbred sales by Paulick Report Staff. Bookmark the permalink.